When it comes to replacing the lamp in your Rear Projector TV (RPTV) lamp, you’ll want to protect your investment and buy from a certified manufacturer or reseller. It may be tempting to buy a generic replacement off the Internet but they may end up costing you more in the long run. Many of these generic brands are priced lower because they’ve been manufactured with inferior or even counterfeit parts. The initial savings upfront may not be worth it if your projector ends up being damaged. On the surface generic brands may appear to be the same but their technology is actually quite different from the official brand lamp manufactured by Philips Lighting. RPTVs use high pressure to generate light and this pressure needs to be controlled inside the lamp. Authentic projector lamps have been calibrated to the exact wattage in order to control the pressure. Too high a pressure may result in the lamp exploding and damaging the inside of your RPTV. A generic lamp may also give off too little pressure resulting in a low light output and a poor picture quality. The lamps also need a high voltage in order to work and so been have designed to meet each projectors specific requirements and dimensions. They are able to hold up to the demands needed to operate within the DLP environment. Non-original lamps have not been designed to handle the subtleties in wattage and pressure. 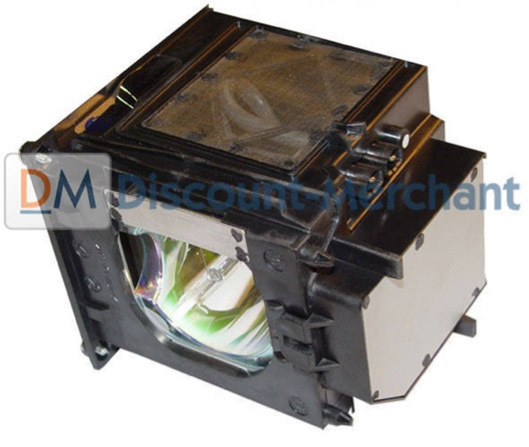 When you purchase the right projector lamp, you are guaranteed it’s going to work and not damage your projector. As the Original Equipment Manufacturer (OEM), Philips handles 60% of the market for RPTV. Their high-quality bulbs have an average life span of close to 2,000 hours and have been manufactured to be compatible with other components of your projector including the ballast and power supply. Once installed, Philips lamps are going to get your projector working at optimum levels. Generic brands sold through the Internet can’t offer this kind of guarantee, particularly those manufactured in China, where the standards are lower and regulations not as strict. Installing a cheaper brand may actually damage other sensitive components connected to your projectors operating system. You may also find your warranty has become void after installing these third-party parts. When you purchase from an authorized reseller and dealer, you know you’re receiving a Philips bulb that is reliable, durable and safe. Why sacrifice peace of mind or run the risk of having your projector break down before a major presentation for the sake of a slightly cheaper generic brand? Simplify your life and buy OEM genuine RPTV lamps.